Buy Battlestar Galactica and PriceWatch, Buy this board game at the Lowest Price. 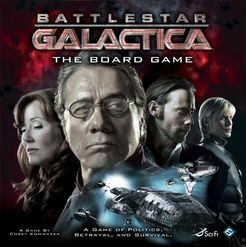 Battlestar Galactica is a board game based on the 2004 re-imagining of the Battlestar Galactica science fiction TV series. The Cylons — a race of bio-cybernetic constructs created by the human colonists — have rebelled and destroyed the human colonies. The surviving humans are now on the run, trying to escape the Cylon raiders and hoping to reach the fabled colony of Earth. Protecting the human refugees is the Battlestar Galactica, apparently the last surviving ship of the Colonial Fleet. Battlestar Galactica is a cooperative board game. Everyone must use their skills and work together in order to escape the Cylons and reach safe haven. There's a problem though… some of the players are Cylons in disguise and are trying to sabotage your mission. Even worse: when you are halfway to your destination, previously loyal crew members may be revealed as Cylon sleeper agents and will now focus all their efforts in destroying the Galactica and the human fleet. The Cylons have managed to destroy the human colonies, and the last surviving humans are on the run in Battlestar Galactica. Take on the role of Commander Adama and the rest of his crew as they try to escape the Cylon invaders and reach the fabled colony known as Earth. Things aren't that easy though: you have Cylons attacking you at every turn, and there are plenty of internal conflicts to deal with. Worst of all, some of the crew are actually Cylons ready to destroy you from within! You can play as the major characters from the TV series. You can be Commander Adama and take on the role of admiral. Or you can play the part of gung-ho viper pilots "Apollo" Adama or Kara "Starbuck" Thrace. Or you can get political and take on the role of President Laura Roslin or Dr. Gaius Baltar. Each character has specific skills, advantages and disadvantages, all of which you have to carefully manage if you are to evade the Cylons and find Earth. At the start of the game, each player chooses which character they will play. The characters all have different skill sets and abilities. For example, Kara Thrace has access to the leadership, tactics and piloting skills. In addition, each character has a set of abilities, such as chief engineer Galen Tyrol being able to perform repairs as a free action. However, each character also has a negative ability. Commander Adama's emotional attachment to his crew prevents him from sending other crew members to the brig. There are also a couple of special positions available. The highest ranking political leader is the President, and has access to powerful Quorum cards and can make certain decisions on his own. The highest ranking military officer is the Admiral, and has control over Galactica's tactical nukes, as well as decides where the human fleet travels to. Each player also receives a secret loyalty card, informing him whether he is a human or a Cylon, and hence whether he should be helping the Galactica escape or trying to sabotage the mission. Things will start to get interesting if the President or Admiral is a Cylon in disguise! Initially, the Cylons are in hiding among the humans, and will attempt to covertly sabotage the mission. However, if they start acting too suspicious, the other players might suspect them and lock them up in the brig. Or they can reveal their true allegiance and start commanding the Cylon fleet to attack the humans! The primary goal of the game is to keep the Galactica operational and maintain the levels of critical "resources" such as food, fuel, morale and population as you search for Earth. Every action you take will work towards that goal, whether it is to use the ship's weapons to shoot Cylon ships, locking up a suspected traitor, launching your Viper fighters, or even piloting your own Viper. However, a "crisis" will occur every turn that might throw a wrench into your operations. These crises represent events that happen during the course of your journey, and are basically the various sub-plots in the TV series. "Passing" a crisis skill check might reward you with more resources, and "failing" one may result in a damaged ship or some crew members in the sickbay. Each skill check will have a number of skills that can help "pass" it. Characters with the relevant skills can use their cards to help, but a hidden Cylon traitor can use cards of a different skill type to sabotage the effort and make you "fail" the crisis! More important are the two possible effects that come with each crisis card. Each crisis card may have a Cylon "action", whether it involves a new Cylon Basestar appearing near you, or having a Basestar launch raiders, or having raiders try to attack your civilian ships or board the Galactica. Results are usually unpleasant, and range from damaged ship sections, injured crew members and having Cylon Centurions boarding and taking over the ship. Each crisis card may also have a "jump" effect, meaning your fleet becomes one step closer to flying off to a new planet on its way to Earth. This is crucial, as the only way for the humans to win the game is to jump far enough to reach safe haven. Of course, the Cylon players don't want that to happen. Battlestar Galactica is a very interesting game that involves plenty of strategic planning (as well as bluffing if you are playing a Cylon in disguise). The cooperative effort to flee the Cylons and reach safe haven is very engaging, especially if you have watched the TV series and know the characters. The game isn't too hard to learn, and the amount of choices and random events guarantee that no two games will be alike. A great game for all skill levels. But the journey doesn't end here; things get even more interesting when the Battlestar Pegasus turns up!